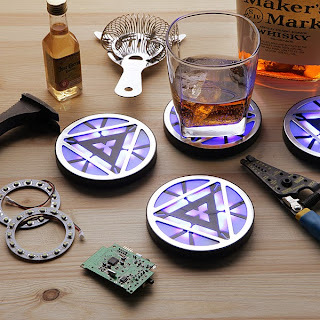 Iron Man Light-Up Arc Reactor Coasters are a thing. And naturally, they come from ThinkGeek. Basically, I think they took the Light-Up Arc Reactor from the Iron Man Arc Reactor t-shirt and threw it on the table in a brainstorming session entitled, "What else could we do with the Light-Up Arc Reactor thingy that's in those t-shirts we have for sale on the site?" and someone yelled, "COASTERS!" I've worked in marketing. I know how these things happen. Regardless, they are still likely to be the best coasters under anybody's tree this year. And they have the added bonus of preventing spilled drinks when you've got the lights out in your home theatre, because you can actually see where you are putting your glass. And they look great when they're not lit, too. Now, granted, the muggles might often compliment you on your Star Trek/ Star Wars/ (insert random sci-fi movie here) coasters. But such is the price to pay for geek chic. You could always buy the corresponding Tony Stark t-shirt, though, and minimize any confusion by finding every opportunity to say, "I am Iron Man." Please oh please oh please?